A week ago, I went out on the limb and predicted that the Denver Broncos would defeat the Seattle Seahawks 31-19 in Super Bowl XLVIII. I wasn't alone. Sixty eight percent of the action chose Denver over Seattle. I figured the score would be a double figures outcome, just the wrong team. Going into the game, the Broncos led by future Hall of Fame signal caller Peyton Manning, scored 606 points. But in any major championship game, there is one thing that decides the outcome. Denver committed four turnovers while Seattle had zero. Seattle led in time of possession 31:53-28:07. It doesn't help when your team ends up in the record books for all the wrong reasons. Seattle took a 2-0 lead by causing a safety 12 seconds into the game which was the fastest score in Super Bowl History. 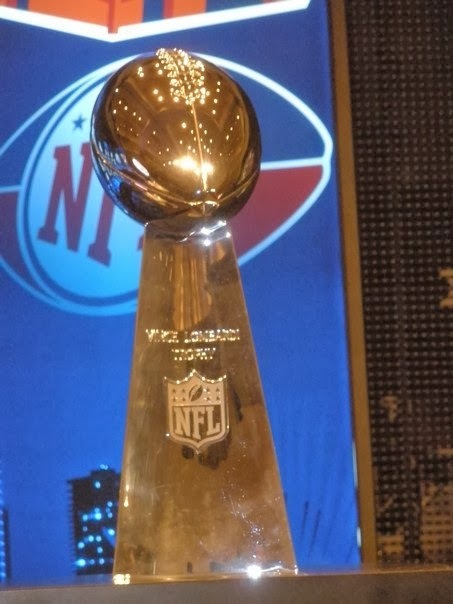 It was the start of a long night which led to a 43-8 Seattle thrashing over Denver to capture the Vince Lombardi Trophy. For whatever it's worth, this is the second time Seattle whipped Denver. During the preseason. Seattle ripped the Broncos on August 17, 2013 at home 40-10. As for Manning, he's 11-12 all-time in the postseason. The Broncos suffered their fifth loss in the Super Bowl, the most in NFL History. Manning was seeking to become the first quarterback to win a Super Bowl for two different teams. Instead, Seattle Coach Pete Carroll joins Jimmy Johnson and Barry Switzer as the only coaches in NFL History to win a College National Championship and Super Bowl title. Carroll used to coach the New York Jets. Have to wonder what the Jets fans were thinking when Carroll was celebrating in their stadium. During this match-up featuring the top defense versus the top offense, Seattle's masterful defensive effort proved that a great defense does win championships as it has throughout Super Bowl History. Offensive football does win regular season games, but during a two-week period to prepare, coaches adjust for the Super Bowl. It was fitting to see a defensive player Seattle linebacker Malcolm Smith win the MVP Award. He returned a Manning interception for a touchdown, plus added 10 tackles, six were solo. In 2008, former Detroit Lions defensive end Cliff Avril endured a 0-16 season. He played a big part in the Seahawks win over the Broncos and has a championship ring to show for his efforts. I couldn't be happier for Seattle for a couple of reasons. First, several years ago, I covered a game around Christmas time in the now demolished Seattle Kingdome and under that concrete dome, the fans were loud. That's when I learned about the 12th Man. Second, during Super Bowl XXXIX on February 6, 2005 on a 59 degree night in Jacksonville, FL., a Seattle Seahawks Public Relations lady was able to get me out of the Press Tent and into the contest, 15 minutes prior to game time when a New York Times reporter didn't show up. She told me to stay near her by the table then signaled me over when word came down from the league. She told me with a smile I'm good to go. The New England Patriots won the contest 24-21. There is a much bigger connection between these two cities than most people realize. The Seahawks and Broncos were division rivals in the AFC West from 1977-2001. Seattle moved to the NFC West in 2002. In 1993-94, a No.1 seeded Seattle Supersonics (63-19) squad lost to the No.8 Denver Nuggets (42-40) in a five game series during the Opening Round 3-2 of the playoffs. This was the first time in NBA history that a top seed lost to the lowest one. Speaking of the Supersonics, they were the last Seattle franchise to win a title in 1979 when they defeated the Washington Bullets in the NBA Finals. As I summarize the Super Bowl, despite the 49 degree temperatures being the third lowest in Super Bowl History, New York/New Jersey caught a major break with no snow. Actually, the snow came on Monday. It seems like they put on a good show. But the NFL awards cities that build new stadiums and did so in this case. The NFL did the right thing by holding a Big Event since the unfortunate events of September 11, 2001. Call it a sentimental pay back. I think the NFL dodged a bullet with the weather and don't foresee anymore Cold Weather Super Bowls in the near future. But now the question is, will Seattle's defense repeat and how much better will their second year quarterback Russell Wilson get? These will be great story lines to follow during the off-season.